UNI EN 1264 applies to heating systems that consist of closed loops of plastic tubing through which hot water produced by a heat generator circulates. The circuits are embedded in the floor screed of the rooms to be heated and supplied by one or more distribution manifolds. The position of the manifold is crucial to the system operating efficiently; it must be as central as possible with respect to the layout of the rooms. Before the tubing can be laid the supporting panel must first be installed. The thermal characteristics of the panel must be such as to ensure compliance with the insulation requirements imposed by the regulations on floor systems. If constructed from a material of poor insulation capacity, the panel must be relatively thick; if the material has high insulation quality, the thickness can be reduced. These thicknesses must be considered net of laying the hydraulic and/or electrical tubing and therefore excluding the layer of levelling that is usually added to cover the tubes. The interpretation of technical standards can sometimes lead to different understandings resulting in time losses and unpleasant misunderstandings between operators in the industry. In order to provide greater clarity, Eurotherm has decided to provide a summary below of the regulations set out in UNI EN 1264. "The standard specifies the main definitions and the corresponding symbols relating to hot-water floor-heating systems used in residential buildings or similar." "This European Standard applies to hot-water floor-heating systems in residential buildings, offices and other buildings, the use of which corresponds to or is similar to that of residential buildings." In summary, all floor systems installed in residential and/or similar buildings (e.g. hotels, retirement colleges, boarding schools, convents, barracks, etc. ), as well as offices, are subject to this standard. UNI EN 1264-1:2011 defines the scope and terms that appear in subsequent parts of the standard; an updated version is anticipated. UNI EN 1264-2:2013 is the part that characterises the product since it provides the tools to determine the performance of the radiant floor system. UNI EN 1264-3:2009 is the part of the standard that offers help in dimensioning the radiant surface system. The updated version contains advice on how to design a cooling-only system, as well as a combined heating/cooling system. UNI EN 1264-4:2009is the part that offers help on the installation of radiant surface systems. It details the minimum material requirements to be used with a radiant surface system and the requirements that have to be met for successful installation. UNI EN 1264-5:2009 is a new part introduced to provide a means of calculating the thermal output of wall and ceiling heating surfaces, and the heat removal capacity of wall, ceiling and floor cooling systems. Useful heat output is more commonly understood as the system‘s "performance" i.e. the capacity of a hot-water radiant floor to provide heat to a room. By "high performance" we mean the radiant floor is able to provide higher heat output at the same water temperature or alternatively, the same output at a lower water temperature. It is advisable to install a "high-performance" radiant surface system to optimise heat generator performance. Designers can compare the available products and choose the radiant floor system that offers the "highest performance" by comparing the certified heat outputs according to EN 1264-2. The manufacturer can declare the heat output of its radiant floor system using the calculation methods proposed by UNI EN 1264-2. Any characterisation of a radiant floor system must consider potential heat output as well as heat loss. where q is the useful output; ϑi is the temperature of the floor-heated room; ϑu is the temperature of the room below; Ro is the sum of the thermal resistances of the layers between the tubing and the room to be heated and Ru is the sum of the thermal resistances of the layers between the tubing and the room below. For the same building, the performance of the radiant system changes with the Rλ,ins value of the insulating panel used with the system. This is the part of the standard that enables dimensioning of the radiant surface. To limit power loss, in Paragraph § 4.1.2.2 the standard states that the insulation panel of the radiant surface system must have a thermal resistance Rλ,ins value at least equal to that stated in UNI EN 1264-4. The standard states that to verify what the thermal power should be of a radiant surface, the heat requirements of the room (calculated according to EN 12831) must be divided by the heating surface; if the figure derived is greater than the maximum power suppliable by the radiant surface, the standard calls for another installation surface to be considered. Different specific outputs correspond to a maximum floor temperature of 29°C according to the degree of uniformity of the temperature reached on the surface of the floor (dependent on the type of surface finish and the distance between circuits); the so-called limit curves define the specific output limits. Once the specific heat demand for each room to be heated has been calculated according to EN 15243 and checked if it is greater or less than the maximum specific output qG, you can start sizing the radiant surface. With regard to the radiant floor, the standard recommends not using, if possible, coverings that have a thermal resistance, Rλ,B higher than 0.15 m2K/W. However, if you don‘t know the type of covering that will be used or whether the covering will have a thermal resistance below than 0.1 m2K/W, standard UNI EN 1264-3:2009 suggests dimensioning the floor system for heavy operating conditions to ensure the room always achieves conditions of thermal comfort, even if the floor covering is changed during the lifetime of the radiant system. Therefore, the standard advises using a floor with a thermal resistance equal to 0.1 m2K/W for all rooms. If the thermal resistance of the floor covering is greater than 0.1 m2K/W, the actual resistance value will have to be considered when designing the floor system. Sizing a floor system consists of determining: spacing between circuits, supply temperature and circulation flow rates in the individual loops of the system. Supply temperature and circuit spacing is determined by comparing the specific heat requirements that need to be met with the working capacity of the floor system chosen. System performance depends on its geometry, the characteristics of the tubing used and the spacing between tubing. A "high-output" floor system means it is made to operate at the lowest flow temperature possible. UNI EN 1264-3 recommends designing circuit spacing according to the room where heat demand is highest, the "problem room". This cannot be the bathroom. The spacing used and output supplied to the problem room determine a system‘s supply temperature. Any of the spacing options available for the chosen system can be used, provided that floor temperature limits are not exceeded. A narrow spacing design results in a lower flow temperature, which benefits system efficiency. The flow temperature must be the temperature at which the temperature drop of the heating loops in the room with the highest heat demand is equal to 5 K.
For example, for a room with a specific heat demand, q 60 W/m2, the flow temperature is 38 °C for 10 cm spacing and 42°C for 20 cm spacing. In reality, if in the problem room we install a ceramic floor covering with a thermal resistance of 0.01 m2K/W and use 10 cm spacing, the actual flow temperature will be 33°C. If however, we were to install a floor covering with a thermal resistance greater than 0.1 m2K/W, for example 0.125 m2K/W, a design with 10 cm spacing would give a temperature of 40°C. Once the system flow temperature has been established based on the power and spacing requirements of the room with the highest heat demand, the spacings for the other floor-heated rooms can be worked out by comparing their specific thermal requirements with the performance of the radiant floor. To facilitate thermal and hydraulic calibration of the radiant floor, it is advisable to use wider spacing for rooms that have lower heat demands. To demonstrate this concept, we plot the output of the radiant floor, which has a covering with a thermal resistance of 0.1 m2K/W, on a graph taking W/m2 as the y co-ordinate and the logarithmic mean temperature difference as the x co-ordinate, for which, as a good approximation, we can use data from the mean temperature difference between the water in the circuits and the room. If you have two rooms with specific heat demands q equal to 70 and 50 W/m2 the average water temperatures necessary to meet the demands are 40°C for the room with the greater thermal need, with 10 cm spacing, and 37°C for the room with the lower thermal need, with 20 cm spacing. This means that with a flow temperature of 43°C, the temperature difference will be 6 K in the first example, and 12 K in the second. 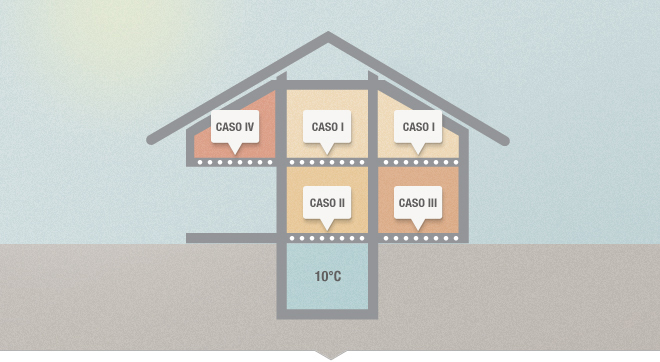 If 10 cm spacing is used in a room that has lower heat requirements, the system will have a higher output. It is therefore important to make sure the mean water temperature is lower if you do not want to have a surplus of supplied power. The graph shows that the mean temperature must be no higher than 33.5°C and the temperature difference 19 K.
Dimensioning the radiant floor concludes with the determination of the water flow rate. For example, if in our ‘problem room‘, which has a thermal heat demand of 60 W/m2, tubing is installed at 10 cm spacing, the water needs to be supplied at 33°C to have a temperature difference of 5 K with a ceramic floor. 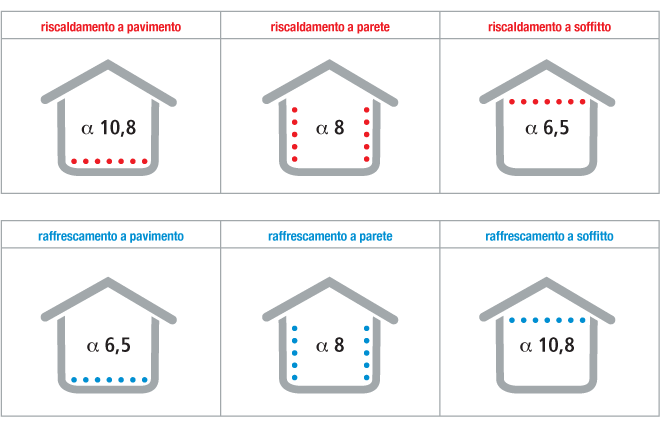 If the room is on the first floor above a garage with a temperature of 10°C, the specific power lost is 3.7 W/m2 if an insulating panel with a thermal resistance of Rλ,ins = 1.48 m2K/W is fitted. Finally, from knowing the heating surface AF, we can determine the water flow rate needed to meet the total thermal capacity demand. If the radiant floor also has a cooling function, UNI EN 1264-3 recommends determining the output of the system in cooling mode, in accordance with UNI EN 1264-5:2009. Dimensioning is done using the same criteria as for heating systems. The summer heat load calculated according to EN 15243 is compared with the output of the system in cooling mode. The standard recommends using a flow temperature no lower than 1 K with respect to the value of the dewpoint temperature, calculated on ambient air conditions. It must be equipped with humidity sensors if operated in cooling mode to prevent reaching dew point temperature. The procedure remains the same for ceiling or wall systems in heating and/or cooling mode. UNI EN 1264-3 recommends determining the output of the ceiling, wall or floor system in accordance with UNI EN 1264-5:2009. Working and flow temperatures are calculated using the same criteria already given for floor radiant systems in heating and/or cooling mode. Insulation panels with a thermal resistance Rλ,ins at least equal to that stated in UNI EN 1264-4 are also recommended for radiant wall and ceiling systems. UNI EN 1264-4:2009 is the part that offers help on the installation of radiant surface systems. It details the minimum material requirements to be used with a radiant surface system and the requirements that have to be met for successful installation. It is the part of the standard that regulates the installation of surface-embedded radiant systems. The introduction to the standard sets out the contents of UNI EN 1264-4 and states that UNI EN 1264-4 applies only to the components that make up the radiant heating/cooling systems; it is not applicable to the other elements that make up the structure of floors, ceilings and walls. This means that, whatever the procedures and choices made before the radiant surface is laid, that established in UNI EN 1264-4 must be complied with, without exception, when installing the radiant system. The standard describes the installation of the radiant surface, distinguishing between radiant floors, walls and ceilings. It defines the conditions that must be present at the time of laying the radiant floor system: the completion of the support base and closure of open parts of the building (e.g. windows and doors). All the service tubing to the systems (hydraulic, electrical, sanitary, etc.) must have already been installed and covered in order to create a base on which to lay the insulation. The insulation of the radiant floor system must have a minimum thermal resistance Rλ,ins greater than or equal to that specified in Table 1 of Paragraph § 4.1.2.2.1. It must be covered on top by a protective layer which can be a polyethylene sheet of thickness equal to at least 0.15 mm or equivalent material. The radiant floor must be laid leaving a perimeter strip along all the walls that delimit the area to be heated. Perimeter strips must also be left around all the structural components of the building that penetrate the screed (e.g. pillars, steps, etc.). The perimeter strip must penetrate down to the very bottom of the support and continue up to the finished floor level, allowing for at least 5 mm of screed movement. The perimeter strip and protective insulation layer must be positioned in such a way that the screed does not seep along the perimeter under the insulation. The distribution manifold must be positioned in such a way as to minimise the length of supply tubing required. This is to avoid excessive supply tubing making it difficult to manage the temperature of the different rooms. It must have two on/off valves and a calibration unit for each circuit. Circuit closure and circuit calibration must be independent. There must be mechanical devices to ensure that no water enters the system at a temperature that could cause very high temperatures to be reached in winter (55°C for traditional screed or as specified by the screed supplier). These devices must also work in the absence of an electric current. It must be equipped with humidity sensors if operated in cooling mode to prevent reaching dew point temperature. The tubing used for the radiant floor circuits must have an oxygen barrier and meet the technical specifications of reference standards. Reference standards for PE-X, PP, PB, PVC-C, multi-layer, PE-RT, PE-MDX are cited in § 4.1.2.5.1 UNI EN 1264-4 . The thickness of the tubing must be such as to meet Class 4 requirements according to ISO 10508, resistant to a working pressure of 4 bar and expected lifetime of 50 years. During transport and storage on site, tubing must be protected from external damage and direct sunlight. Tubing must be laid at least 50 mm from the perimeter and 200 mm from any possible cause of damage to the tubing e.g. flues, fireplaces with low hearths, balcony edges with embedded railings, etc.). The radius of curvature must comply with the manufacturer‘s instructions. Tubing must be attached using a secure anchoring system that ensures the tubing does not move more than 5 mm vertically and more than 10 mm horizontally from the position where it was installed. 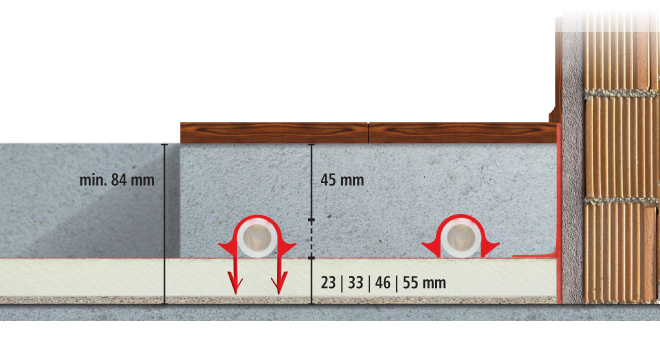 The two lengths of tubing of each circuit that cross the expansion joint (both the feed and return tubes may cross only once) must be protected with flexible insulation material for a length of at least 0.3 m.
Before laying the screed onto the coils, a pressure of no less than 4 bar and no greater than 6 bar must be applied to make sure there are no leaks. This test can be performed using water or compressed air. The absence of leaks must be documented in a test report which must also include details of the pressure at which the test was performed. In relation to the screed, UNI EN 1264-4 recommends that its thickness is no less than that stipulated by the regulations specifying screed load capacity and bending strength class. The screed must be laid respecting the expansion joints where necessary. Joints must be positioned - and be of sufficient number - to delimit areas not exceeding 40 m2 and no longer than 8 m. These dimensions may be exceeded in the case of rectangular areas if one dimension is no more than double the other. There must be no areas of irregular shape. Joints must be positioned by all the doors. If superficial cuts are made to the screed, these must not have a depth greater than a third of the thickness of the screed. Extreme care must be taken when laying the screed so as not to damage any of the components of the radiant floor. The laying of the screed and subsequent drying for least 3 days must take place at a temperature not less than 5°C. For at least 3 days the screed must be protected from drying too quickly. Such protection may be necessary for a longer period if the type of material used for the screed so requires it. The flooring contractor must check that the chosen floor finish is compatible with the conditions. With regard to radiant ceiling and wall systems, the regulations refer to the prescriptions already described for radiant floor systems, with the following additions and/or modifications: Walls and ceilings must be able to support the radiant system. The layer of insulation necessary to achieve the minimum thermal resistances shown in Table 1 of Paragraph § 4.1.2.2.1 may be divided into two separate layers, depending on adjacent room conditions. For example, in the case of an external wall, one layer will be installed directly behind the radiant system and a second layer will be installed externally. The supply temperature of the radiant and/or ceiling system must not exceed a maximum value which is dependent on the material into which the tubing is embedded. For example, in the case of plaster, the flow temperature must not exceed 50°C.